Rigler sign is a double wall sign suggesting pneu­moperitoneum and intestinal perforation, and it needs emergency surgical treatment. Early diagnosis of intestinal perforation by clinical symptoms, presence of Rigler sign in abdominal radiography, and then early surgical treatment can reduce mortality. Here, we report a patient with Crigler-Najjar syndrome who underwent liver transplant and then developed posttransplant lymphoproliferative disease and received chemotherapy with cyclophosphamide, doxorubicin, vincristine, and prednisone plus ritux­imab. She was referred to the emergency department due to abdominal distension with positive Rigler sign in abdominal radiography; intraoperative findings revealed intestinal perforation. Pediatricians and surgeons should be aware of Rigler sign so that it is diagnosed early and emergency surgical treatment can be performed. The radiographic findings of pneumoperitoneum include air under diaphragm, which is most common, and also Rigler sign and air around peritoneum, which is referred to as the football sign.2,3 Here, we present a case of intestinal perforation with positive Rigler sign. A 28-month-old girl with known Crigler-Najjar syndrome underwent liver transplant 6 months earlier at an affiliated hospital of Shiraz University of Medical Sciences (Shiraz, Iran) in May 2014. She was on immunosuppressive drugs, including prednisolone and tacrolimus, and also ganciclovir prophylaxis. After she developed cervical and mesenteric lymphadenopathy 5 months after liver transplant, a lymph node biopsy was performed with pathologic report showing polymorphic lym­phoproliferative disease. Her dose of immuno­suppressive medications was reduced, and the patient received CHOP chemotherapy (cyclophosphamide, doxorubicin, vincristine, and prednisone) plus rituximab. Four days after receiving the first course of chemotherapy, she was referred to the emergency department due to abdominal pain and distension, bilious vomiting, and low-grade fever. Physical examination revealed a conscious patient with temperature of 37.9°C (orally), blood pressure of 75/55 mm Hg, generalized abdominal tenderness without rebound tenderness, and normal heart, lung, and nervous system examination. 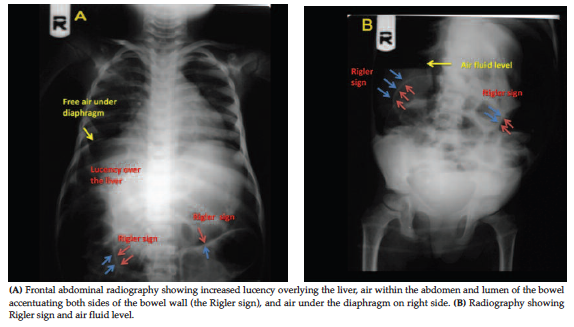 Abdominal radiography showed increased lucency overlying the liver, the Rigler sign, air fluid levels within the bowel loops, and air under the diaphragm (Figure 1A and 1B). She underwent an operation and received broad-spectrum antibiotics. Intraoperative findings revealed multiple small bowel perforations and peritonitis; therefore, a small bowel resection was done. During follow-up, the patient died due to sepsis. It should be noted that written informed consent was taken from her parents before study. The prevalence of PTLD, a severe complication after organ transplant, is about 6% after liver transplant.5 In our study case, intestinal perforation with Rigler sign occurred 4 days after administration of CHOP chemotherapy plus rituximab. Our case study had involvement of the gastrointestinal tract by PTLD. As described above regarding causes of pneumo­peritoneum, it seems that the most probable cause of intestinal perforation in this case was necrotizing enterocolitis or secondary to medication, including rituximab and immunosuppressive agents. Therefore, in patients with PTLD, especially with gastrointestinal involvement, the use of rituximab, because of its probable involvement with intestinal perforation, should be administered with caution, and abdominal pain should be considered as an alarming sign after its use. Supine abdominal radiography is an important inexpensive and available diagnostic procedure in these patients. Air under the diaphragm on the right side of the abdomen is the most frequent sign of pneumo­peritoneum; the second most common sign is Rigler sign, characterized by the presence of air in luminal and peritoneal sides of the bowel loop.1,2 Therefore, physicians must be familiar with Rigler sign, as illustrated in Figure 1, because accurate and early diagnosis of intestinal perforation by clinical symptom, presence of Rigler sign in abdominal radiography, and then early surgical treatment can reduce mortality. It is also recommended that, in PTLD patients with gastrointestinal involvement who are scheduled to take rituximab, the surgeon should be informed to be ready for complications. Markogiannakis H, Fili K, Spaniolas K, Bizimi V, Katsiva V, Theodorou D. Rigler sign: an underappreciated alert for pneumoperitoneum. Am J Surg. 2008;196(3):e5-e6. Lee J, Pawa S, Quaas J, Shah KH. Rigler sign: a subtle finding of pneumoperitoneum. Intern Emerg Med. 2010;5(4):353-354. Ly JQ. The Rigler sign. Radiology. 2003;228(3):706-707. Cornejo A, Bohnenblust M, Harris C, Abrahamian GA. Intestinal perforation associated with rituximab therapy for post-transplant lymphoproliferative disorder after liver transplantation. Cancer Chemother Pharmacol. 2009;64(4):857-860. Shakibazad N, Honar N, Dehghani SM, Alborzi A. Epstein-Barr viral load before a liver transplant in children with chronic liver disease. Exp Clin Transplant. 2014;12(6):534-538. Winter MC, Hancock BW. Ten years of rituximab in NHL. Expert Opin Drug Saf. 2009;8(2):223-235.